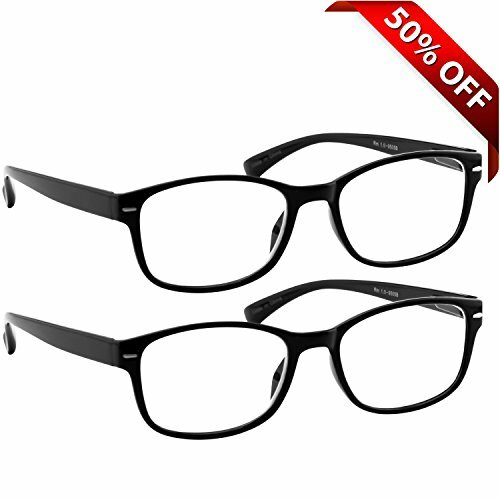 VALUE IS ONLY THE BEGINNING: Aren't you tired of flimsy glasses that look cheap? Wearing these reading glasses at home, in bed, at the office, or wherever you need them, means you'll always look sharp, and see sharper! DURABLE BEYOND MEASURE: We ENGINEERED these reading glasses to withstand the daily elements with Sure-Flex Comfort Spring Arms and Dura-Tight Screws. The result? Reading glasses which outlast and outshine the cheaply made readers. QUICK-CLEAN PROTECTION CLOTH: Each Pair of our reading glasses comes with its individual micro-fiber cleaning cloth bag to remove those annoying smudges before they get in the way. COMFORT GUARANTEE: If you've purchased reading glasses online before you probably know what we mean by "the wrong fit". Pinchy-tight, or too-loose reading glasses which slide down your nose are enough to drive anyone crazy, which is why we designed these reading glasses to support your ultimate comfort; with durable spring hinges which easily expand hug your temples, for the perfect fit, every time; backed by our 100% Guarantee. If you have any questions about this product by TruVision Readers, contact us by completing and submitting the form below. If you are looking for a specif part number, please include it with your message.